Did you ever heard a deep house mix by DJ Marky? No? Same here. And I'm absolutely delighted. First class deep house DJ mix. Tracks from Electrosoul System, Big Bud, Technicolour, Cutworks, Calibre, Pryzma, Chase & Status, DJ Marky, Random Movement, Lenzman, Submorphics, Spherique, Kubrak, Serum, Soul Connection, David Boombah etc. Winter mix to get those warm feelings too. 28) Grimm & Jaybee - Bi#ch Betta Have My Money! Drifta & Static - Born To Make It - ? PennyGiles - Au Revoir BlackBird - ? PenyGiles - Oedipus Violins - ? Furney - Doobo Delaniv - ? Absolutely amazing mix full of fresh liquid funk vibes! Promo DJ Mix for "Concentration EP". Of course 4 my tunes include this mix & also a few world wide fresh beats inside. You can pre-order "Concentration EP" on iTunes Store right now. 1.) Zyon Base - "Ghetto Blues"
2.) Scott Allen - "Brighter Day"
3.) Smote - "Born To My Soul"
4.) Technicolour & Komatic - "Changeling"
5.) Lenzman - "Memory Loss"
6.) Nuage - "Between Trees"
7.) Blu Mar Ten - "Blind Soul"
9.) Nuage - "Different Places"
10.) Big Bud - "Fumbledub"
13.) Vital - "Only For A Second"
14.) Smote - "Deeply In My Soul"
15.) Decem - "True Lies"
16.) Technicolour - "Day In Day Out"
So here it is, in too deep with a rather fast-paced mix to fill your plate with another healthy serving of moms stuffing and mashed potatoes. As many of you already know, I had a little celebration planned for all of you when I earned my 5000th fan on the facebook fanpage, so just for kicks I’m giving away a tune I’ve been siting on for far too long, one called “Purple Getaway”. I am still working out the kinks of the master, but you can expect an updated post in the next few days with a link to download the tune. Please, play it to your little hearts content all over the place. …and as for you US kids, pass the cranberry sauce and save me some dark meat. Magnafide is a founding member of the Fourth Level Collective, a group of D&B producers and deejays from Los Angeles focusing mostly on Liquid Funk. The crew has been involved in the local scene for almost 10 years. 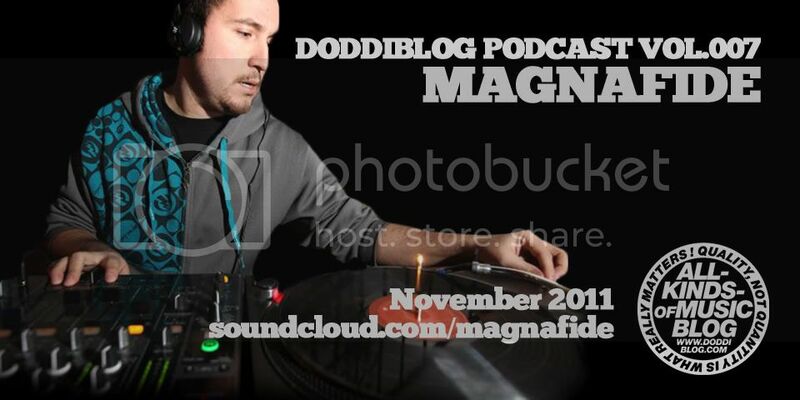 Magnafide has releases out on Peer Pressure Recordings and forthcoming releases on Soul Deep Recordings. New project in 2011/2012 is a collaboration with fellow Fourth Level members Living Proof & Teal under the name: Holistix. a mix i did for Tom Bulwer's 2Deep House Show on Ministry Of Sound Radio...enjoy! Seeing as the last two weeks have gone by without a guestmix I thought I’d cobble something together incase people are looking for something a little longer than a few minutes to herald in the Autumn with. A live mix of some of my favourites at the moment. I started with the intention of keeping it slow but got a little carried away, as you do. So it gets just a little bit fun towards the end. Do you remember Greenfly who released couple of excellent tracks on Good Looking rec? Electrofusion, G-Funk, Gulfstream...? Good ol' dnb daze! Here's one of his recent mix from July 2011 @ Subfactory, Reading. Enjoy! Djing has always been a little bit more than just playing records to Jonny. His Djing style derived from a plethora of genres and styles aquired over a lengthy period of time. His love of all things electronic, deep, emotive and body moving, the staple of his energetic dj sets. Its all about the Journey where Rebel is concerned. An hour of deep house goodness to warm your cockles ahead of next week's return of Digging Deep in Singapore. Mix recorded live at MIE on 28th October 2011.